That was the announcement made by the FAA just this past Monday. Starting December 21st if you buy a drone either for commercial reasons or simply to have a little fun you will need to register it with the FAA if it weighs 9 ounces or more. If you purchased a drone before December 21st you have 60 days to register but newly purchased drones are illegal to fly until registered. The FAA states that the reason for registration is to encourage drone operators to behave more responsibly and to know there will be consequences if they do not. This holiday season it is expected that approximately 400,000 drones will be purchased and the FAA has enacted this new legislation just in time for the expected surge in sales. The fee to register will be $5. Although the FAA recommended free registration federal law apparently requires that a minimal fee be charged. Anyone who registers within 30 days of the December 21st start date will actually be refunded the initial $5 fee and all registrations will be valid for a 3 year period. The FAA also states that it is working with retailers to provide point-of-sale registration in the future as a convenience to buyers. If you are wondering what the big rush to enable this new legislation is all about, it is due to a number of complaints about misuse that have been reported to the FAA regarding drones. In the last 2 years there have been 921 reported near collisions between drones and manned aircraft as well as operators “spying” on their neighbors or using their drones for other “nefarious” purposes. Transportation Secretary Anthony Foxx recently commented that registration is only a "first good point" of being able to identify the owners of drones that are being used improperly and that the "bad guys" won’t bother to register their drones. 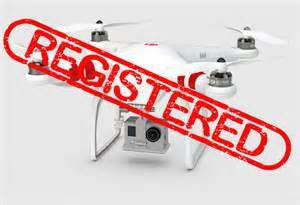 Some advantages to the registration will include being able to locate the owner if a drone is lost or involved in some type of incident.